With an average readership of 37.7 lakhs across the nation with a circulation of 14 lakhs, Hindustan Times is one of the best newspapers in India. The paper was found in 1924 and has 1.16 million copies as of November, 2015. Balanced and honest storytelling, from political correspondents to photographs, everything about this newspaper is unique and one-of-its-kind. The newspaper has rich social content which has not only helped it to grow amongst the readers but is also beneficial for those who want to book ad in Hindustan Times. The readers associate with the paper because of its heritage value of fair, independent and accurate reporting. Also, their pace in delivering stories is quite fast and modern which always makes the readers keen. 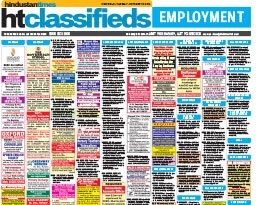 Not just a big advertisement, even the Hindustan Times classified advertisement can be quite beneficial for any product or company which has the intention of reaching out to more and more people.